Water is the most essential ingredient of human life. Our bodies consist of 66% water, and we drink around 2 liters every day! Yet not everybody in the world has access to good quality water. Some shocking statistics indicate just how much of an issue unsafe water is all over the world: around 1.1 billion people do not have access to safe drinking water! Overall an estimated 900 million people suffer and approximately 1.8 million die from water-related diarrhoeal illnesses each year – the vast majority of which is concentrated on children in developing countries. Ultraviolet (UV) light has a well documented ability to inactivate bacteria, viruses and protozoa in water. 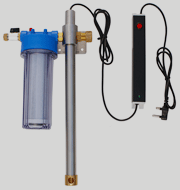 It is widely used in water treatment systems at both the municipal and household levels. UV light is high energy electromagnetic radiation with a wavelength between 100 and 400 nm, which is invisible to the human eye (see the image below). UV light can be divided into four wavelength ranges known as vacuum UV, short wave UV (C), middle wave UV (B) and long wave UV (A). Short wave UV, or UVC, in the spectral range of 200 to 280 nm is the most effective for germicidal purposes. The absorption of UV energy by the living cells of pathogens results in photochemical damage to DNA or RNA. The amount of cell damage caused by exposure to UV light of a certain wavelength is dependent upon the dose of UV energy absorbed by the micro-organisms and their resistance to UV. When UV light passes through water its intensity is reduced. The rate at which this happens depends on the transmittance of the water. Ultraviolet transmittance (UVT) of water depends on its turbidity, and on the concentration of certain substances such as iron and manganese. Scale forming, due to hardness of the water, on the UV light source also reduces the effectiveness of the disinfection. The AquaDoc UV lamp has an integrated quartz sleeve, which protects it from the water and is replaced every 18 months together with the lamp. This means you will never have to worry about the build-up of scale in your device and there is no need to regularly clean the sleeve as in many other devices. The high energy of short-wave UV light means it can be harmful to humans; it can cause reddening of the skin (erythema) and inflammation of the mucous membranes of the eye (conjunctivitis). It is important that people avoid exposure to UVC and take necessary precautions when working with UV systems. To improve user safety the AquaDoc UV is designed in such a way that it prevents users from removing the lamp from the stainless steel housing while it is still on. The QuaWater AquaDocTM UV provides you and your family with the peace of mind that the water you are using is safe and of good quality. 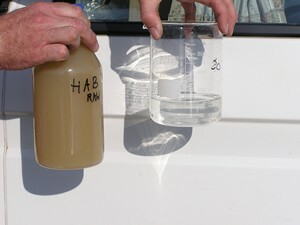 Numerous techniques, processes and products are available for treating water. All these systems use combinations of technologies and processes that are suitable for the type of raw water that is being treated.